The boys are participating in a summer reading program at our local library again. As I have mentioned in the past, it really helps to motivate kids to take time and read during the two months away from school. Of course, they are not the only ones that like to read. I have a lot of books that I want to read and only wish I had more hours in the day. This summer there are a few books that I hope to read about Autism and related items. My goal is to come up with more information that will help my son, his teachers, and our family to make the transition from elementary school to middle school in a little over a year easier. I also like to preview some books that the boys may read before they get to them. Of course, I also want to play catch up on Ridley Pearson’s Kingdom Keepers series. I am now two books behind and would love to catch up before the last in the series is released. My Kindle is also stocked with several Net Galleys of books that will be coming out soon. It is always fun to get a sneak peek of books coming soon. To say that my to-read list on GoodReads is large would be an understatement. In addition to this, I will be reading books with the boys. NHL and I have all of the Splurch Academy for Disruptive Boys books to complete. Last summer, JSL and I voraciously read through practically all of the Magic Tree House books and are waiting for the next releases. No doubt he and I will find something to read together, plus he will be reading books to me this year. Now to make a plan and get ready to start next week. 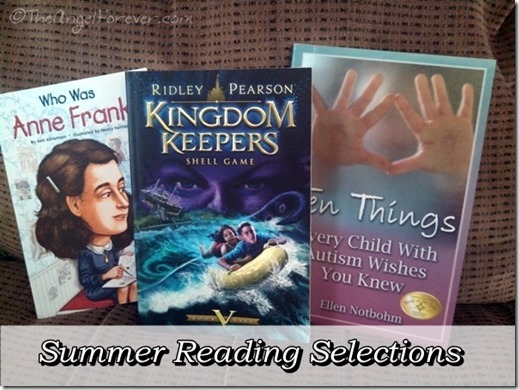 So what is on your list of books to read with your children or solo this summer? I would love to hear about more titles that other people are reading. As always, Tuesday Tales is all about sharing our love of books. Please let me know what you have read recently. Be sure to link up to your book posts in the comments below. Include something you read on your own, with a child, or someone else. Thank you for this post. I need to read the last couple Kingdom Keepers myself! I’ve been debating starting a “real” chapter book with my daughter and wasn’t sure if she was old enough. When you mentioned you read Magic Treehouse with JSL last year, I thought we would give it a try as she’s the same age as he was last year. We read the first 2 chapters of Dinosaurs Before Dark tonight. Though I think she’s getting used to reading a book that doesn’t have pictures on every page, she followed along well and I think she’s enjoying it! Thank you!! !